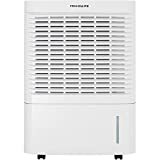 Frigidaire - FAD954DWD : Dehumidifier Review • The Air Geeks, reviews of air conditioners, dehumidifiers and air purifiers. Have you been struggling to control the relative humidity of your room? The FAD954DWD is a high capacity humidity control system that ensures that your house has a comfortable environment. This dehumidifier is capable of drawing up to 95 pints of moisture from the air per day. In addition, it features user-friendly controls and an extra-long power cord. In case you are considering buying the FAD954DWD, you are most certainly looking for reliable information about its performance, features, strengths, and even weaknesses. If that is what you are looking for, then you have come to the right place. We have researched thoroughly to provide you with reliable information that will help you to make a well informed decision. To start with, we will explore its features and performance. Let’s go! 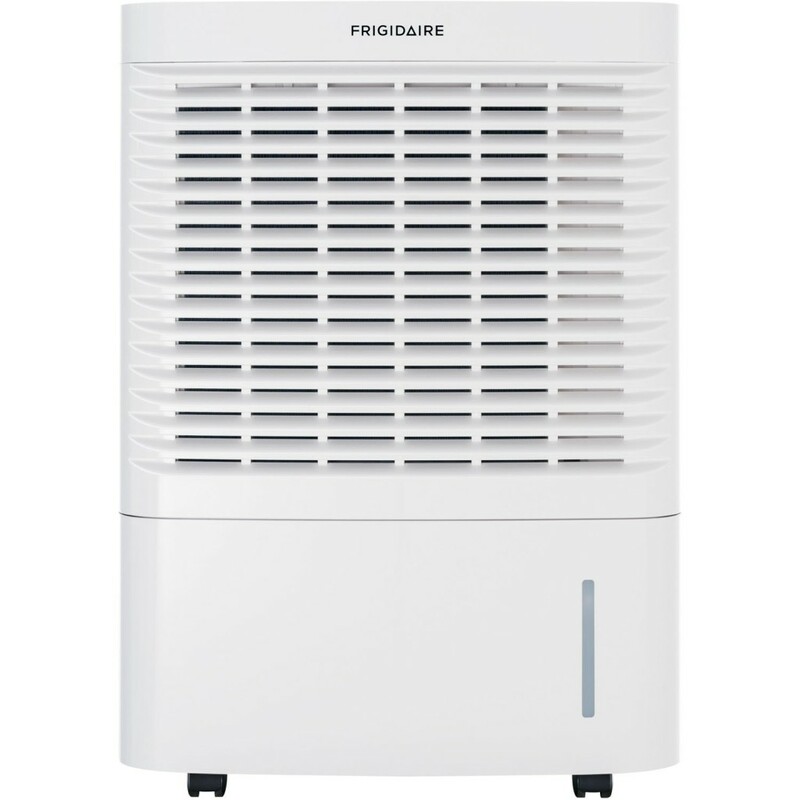 The FAD954DWD is a high capacity dehumidifier that is designed to ensure that your home is free from excess moisture. This 95-pint unit ensures that the relative humidity of your room remains within the desired level to create an unsuitable environment for the growth of mold and mildew. Furthermore, by controlling the levels of moisture in your home, this unit helps to protect your possessions from rotting. 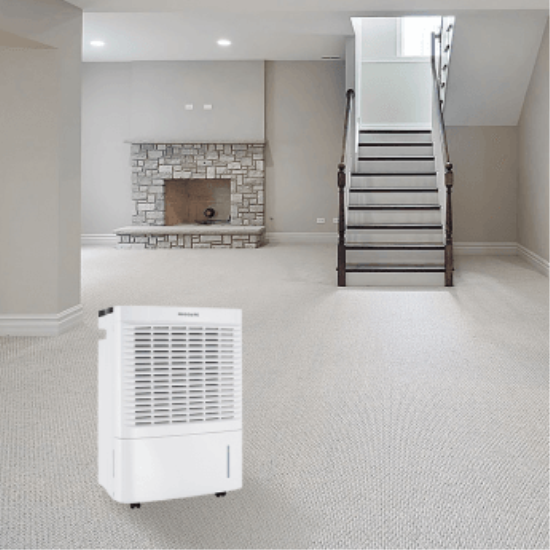 Are you looking for a dehumidifier that you can move from one part of your house to another? The FAD954DWD is a portable dehumidifier that you can move from one room to another depending on your dehumidification needs. <b>It features caster wheels and integrated handles that make it easy for users to push or carry it upstairs and downstairs.</b> In addition, this unit is designed to allow effortless humidity control. All you need is to set your desired percentage and relax. The FAD954DWD features user-friendly electronic controls that enable users to control the relative humidity of their rooms with ease and convenience. In addition, it features an easy-to-access container for holding the captured water. This reservoir has a level indicator that enables users to monitor the amount of accumulated water without the need to detach the 9.4-pint container. Although this unit draws a lot of water from the air, it lacks an built-in pump. In cases where the condensate cannot be drained under gravity, an external pump is required. A powerful dehumidifier such as the FAD954DWD should have an inbuilt pumping mechanism. Are you looking for an energy-efficient system that delivers high performance while consuming minimum power? If that is what you are looking for, then you may need to think about another brand. This unit consumes 870W and it is therefore an unsuitable option for people who want to save money. Effective dehumidification. This unit pulls a lot of water from the air per day. It is capable of drawing up to 95 pints in 24 hours. Easy to unpack and install. We have noted that you can unpack and install this unit in less than 15 minutes. Inaccurate humidity meter. We have noted that the inbuilt humidity meter of this dehumidifier does not give an accurate reading. High electricity consumption. This high capacity unit draws a lot of power and it may not be a suitable solution for people who are looking for an energy-efficient system. Lacks a pumping mechanism. This unit pulls a lot of water from the air and fills the container a couple of times in a day. In cases where the condensate cannot be drained to an external sink under gravity, it can be a cumbersome task to empty the tank manually. In such cases, an external pump is required. I bought one of these for my very humid North Carolina beach home. My basement is about 2800 SF divided into a main room and a garage. In the garage, we use the smaller 70-pint version of this same unit, leaving the larger unit for the main area. So far, both units have exceeded my expectations. Although it comes in a large, cumbersome package, it's actually easy to unpack and setup. The most challenging part - and it's really not a big deal - is getting the casters on the unit. There's also the matter of drainage...95 pints a day is a lot of water - you really need a drain and some plumbing for a unit this size. I'd recommend a condensate pump - I use one of the Little Giant units , and the whole setup works perfectly. I have the dehumifier connected to my home automation system, and there are several benefits. For one, I have a few humidity sensors scattered around my basement, and this gives me a much better picture of humidity conditions. The Fridgidaire has a built in humidity meter, but it reports the humidity in the vicinity of the unit - a very different level than found several feet away. Many times, the unit will report 40%, but my humidity meter at the edge of my basement is in the mid-60s. The other thing I get from my home automation system is very accurate energy consumption data. In operation on the high setting, this unit draws 628 watts. In my area, electricity is 9.69 cents per KWH, so operating continuously, this unit costs $44 per month in electricity, not including the condensate pump. The real story is the performance. When I first turned on the unit, humidity was about 90% - downright swampy. Within two days, humidity dropped to mid-50s, and then 40's after a week"
Previously to this unit, I have owned both the Frigidaire 70-Pint and 50-pint dehumidifiers. I have a finished basement, but half of it is underground, thus I get a ton of moisture. While both Frigidaire units were excellent, the 50-pint was simply overwhelmed. The 70-pint could get the job done somewhat, but it had to run 24/7 and it still was a bit humid. I bought multiple Frigidaire units in the past because I was impressed with their reliability and noise profile. Enter the 95-pint Frigidaire. This thing blows away the moisture in the air, literally. I have it hooked up via continuous drain and it is able to tackle my whole basement with ease; it does a much better job than even the 70-pint unit. Although, it is also larger by about 5" in width and 3" in depth to the 70-pint unit plus it weighs what feels like twice as much; you are best off using 2 people to move this. However, once in place, moisture problems will be no more. Mold be gone! At the highest setting, it can be a bit loud, but at medium it is more than quiet enough for the typical living space. At low, it is very quiet but of course less effective as well. The unit comes with a number of presets and a timer, but it also has manual override for you to tweak settings to your desire. Once you get to know the machine, you will likely go for the manual override - but the presets are nice for quick adjustments. Overall, I couldn't be happier with this machine. It is built like a tank and gets the job done. Best of all, you can customize its noise and moisture-removing capabilities to your living space. Highly recommended!!" At the Air Geeks, we like the Frigidaire brand, maker of sturdy, reliable units that will satisfy its users. It is undeniable that the FAD954DWD is among the most powerful dehumidifiers available in the market today. Its 95-pint capacity makes it a suitable option for large living rooms, offices, computer rooms, labs, and so on. Its washable filter allows it to filter a variety of airborne particles, bad odors, and harmful disease cause microorganisms such as bacteria. Although this unit delivers impressive performance, we have noted that it consumes a lot of power and it is therefore not a suitable option for people who are looking for energy-efficient dehumidifiers. Considering its capacity, this unit should have an inbuilt pump. However, it does not have one. Still, an excellent buy for which we have awarded and excellent rating. Follow the geek!